Friends, it’s BBQ season! Are you ready? I’ve been anxiously waiting to get my grill on. We picked up a new BBQ this past week and I’ve been imagining all the yummy recipes I was going to make. I pictured a summer full of backyard parties with friends and family where I could show off my grilling skills and share some new recipes. I knew exactly which recipe I wanted to make first: Deluxe Pizza Burgers. Burgers and BBQs go together like peanut butter and jelly. You can’t have one without the other, at least in my humble opinion! I picked up a bunch of my ingredients at M&M Food Market. If you are grilling this summer, you need to visit your local store. They have a ton of products perfect for grilling season. They are currently running their “Let’s Figure Out BBQ” campaign to help Canadians make the most of grilling season. I’m all stocked up for summer now with a freezer full of items just waiting for me to grill and serve to my family and friends. My family could not get enough of these Deluxe Pizza Burgers. 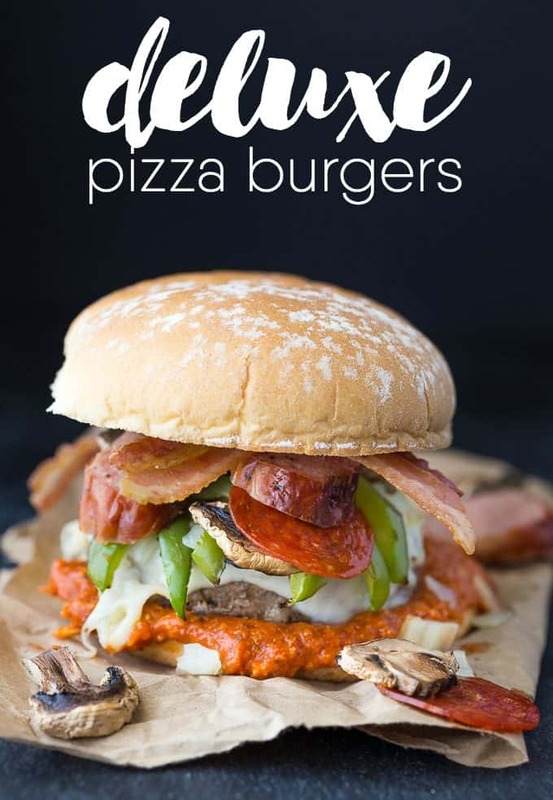 They are a delicious and filling combination of two of my favourite foods: pizza and burgers. Plus, they are easy to make with most of the toppings cooked on the grill alongside the meat. I picked up a bag of Diced Onions. Cook them right from frozen with a little bit of butter in a grill basket lined with aluminum foil. They are perfect for burgers and best of all, you don’t have to chop or peel. I always cry when I cut onions. Grilled mushrooms and green peppers anyone? I love the smoky flavour grilling gives to fresh veggies. I used a grilling grid and basket to cook them. And yes, I made extra mushrooms for a side dish to our burgers. 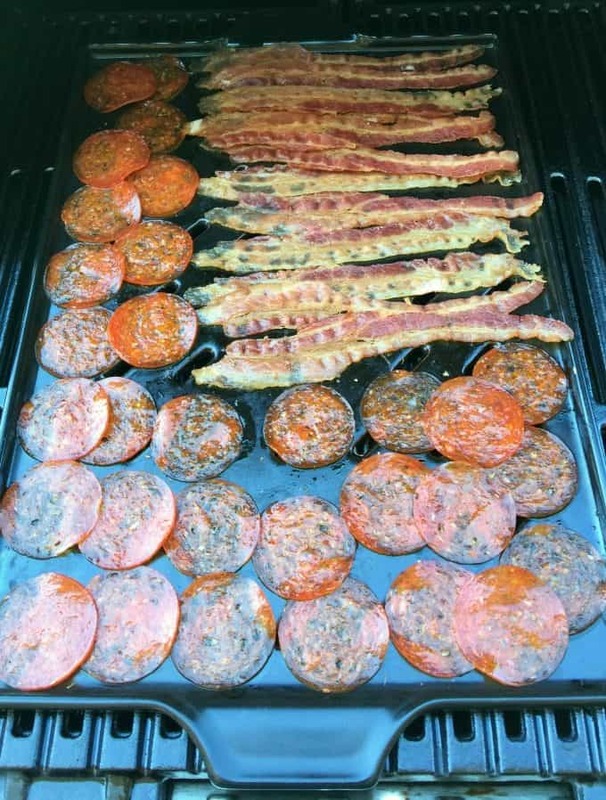 I heated the bacon and pepperoni on the grill for about a minute. I purchased the Fully Cooked Bacon that only requires you to heat it up in the microwave. I took mine to the grill instead to save me from running back inside the house. You can’t have a deluxe pizza without the sausage. These Mild Italian Sausages add a bit of spice to the burger. They grill perfectly from frozen in about 20 minutes. The burgers are the stars of the show. M&M Food Market has a fabulous selection of burgers so it was a hard choice for me to decide which ones to use. I settled on the Angus Beef Burgers with their thick, juicy and flavourful patties. Each side takes about 7 minutes each to grill to perfection. My “Burger Bar” was ready to go! 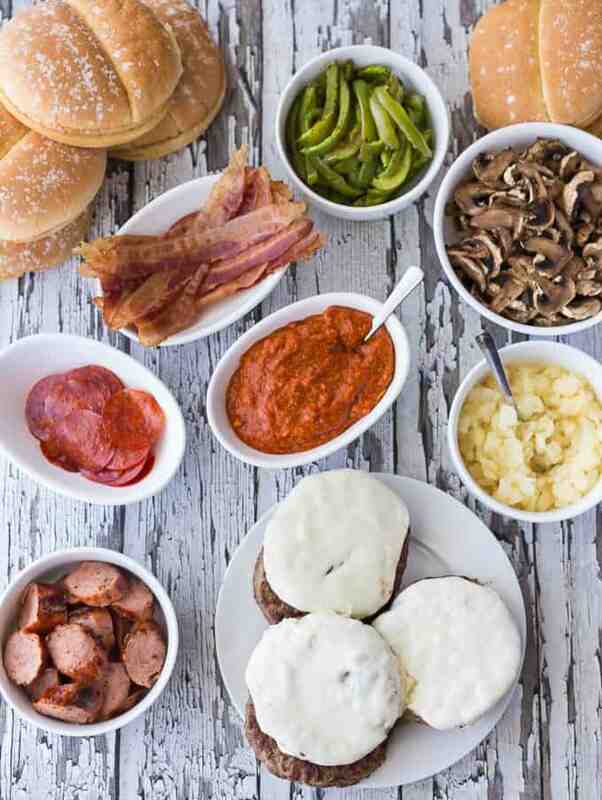 People can pick and choose which toppings they want on their Deluxe Pizza Burgers. For me, I loaded mine with EVERYTHING to get the full taste experience. The Mozza Marinara Dip makes the perfect pizza sauce. I love that it has mozzarella cheese mixed in. During the last minute of grilling, I added a slice of mozzarella cheese to the burgers. It melts so quickly so you don’t want to leave it on the grill too long. Add a little grilled onion. Grilled green peppers. They were perfectly cooked with just the right amount of crunch. 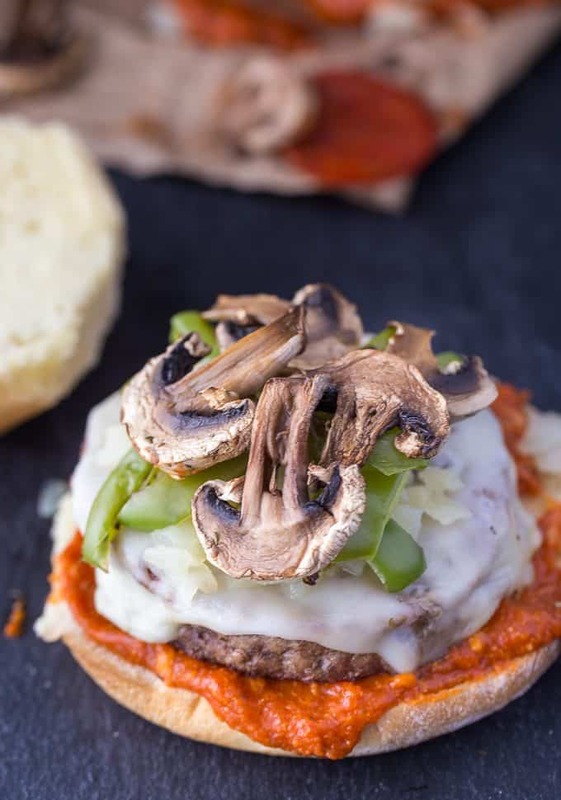 Grilled mushrooms go with anything especially pizza burgers. You don’t really have to grill the pepperoni unless you want to. Like I said, I was excited to try out my new BBQ so I grilled mine. On the other hand, grilling the sausage is a must. It’s my favourite way to cook it. The bacon was fully cooked and heated up on the grill instead of the microwave. Easy peasy. Pure burger bliss. It doesn’t get much better than this! This burger recipe is what grilling season is all about. It’s fun to be creative with the grill and try out new recipes! These six burgers were gobbled up by my family in record time. It’s a good thing I bought extras! According to a new survey commissioned by M&M Food Market, 95% of Canadians grill in the summer. If you are one of them, I hope you’ll give my recipe a try! M&M Food Market’s ready-to-grill products make it easy to serve delicious meals your family will love. Check out their handy store locator to find a store near you. I also wanted to mention M&M Food Market’s recently launched Real Food for Real Life campaign where they promise to only offer products with no artificial colours, flavours, sweeteners or added trans fats across their full product lineup by the end of 2017. Along with the convenient shopping, diverse and delicious selection, it’s just one more reason to love the brand. They have a fan for life in me. Watch for my upcoming post where I’ll be sharing grilling tips and more interesting tidbits from the survey. In the meantime, try my recipe and let me know what you think! You might also like these Pizza Rolls or Chicken Caesar Pizza. Loaded to the max with all your favourite pizza toppings. 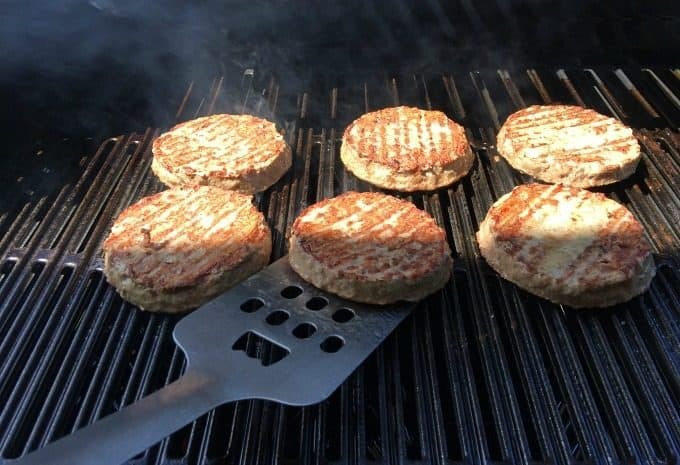 Take one bite and you’ll see why my family raves about these delicious burgers! 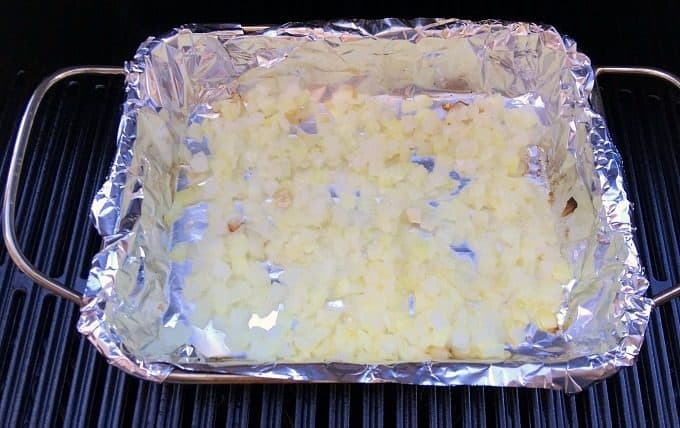 Add onions and 1 tbsp butter to a grill basket lined with aluminum foil. Preheat BBQ on high. Reduce heat to medium and place grill basket, covered with aluminum foil, on the grill. Stir occasionally. Cook for 10 minutes and remove from heat. 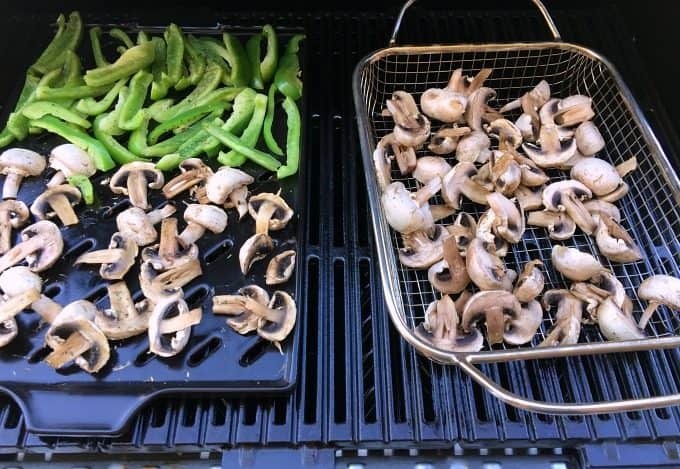 While the onions are cooking, place mushrooms and green peppers on a ceramic BBQ grid (or directly on the grill) and sprinkle with Italian seasoning. Cook for 10 to 12 minutes, stirring occasionally. Set aside. Turn the grill down to medium low. Place pepperoni and bacon on a ceramic BBQ grid or grill basket and cook for 1 to 2 minutes. Add the sausages to the grill and cook for 20 minutes, turning frequently. Let cool a little and slice. Turn the grill up to medium heat. Add the Angus Burgers and cook 7 minutes per side or until done. 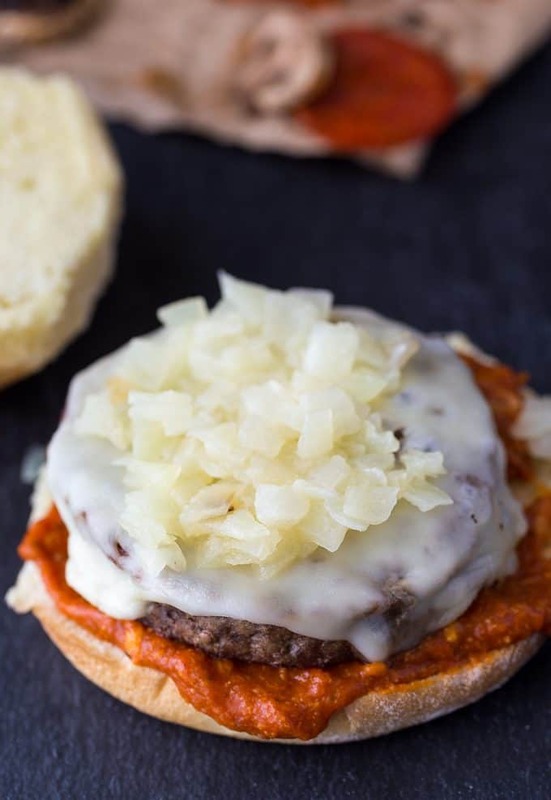 Add a slice of mozzarella cheese to each burger during the last minute of cooking. 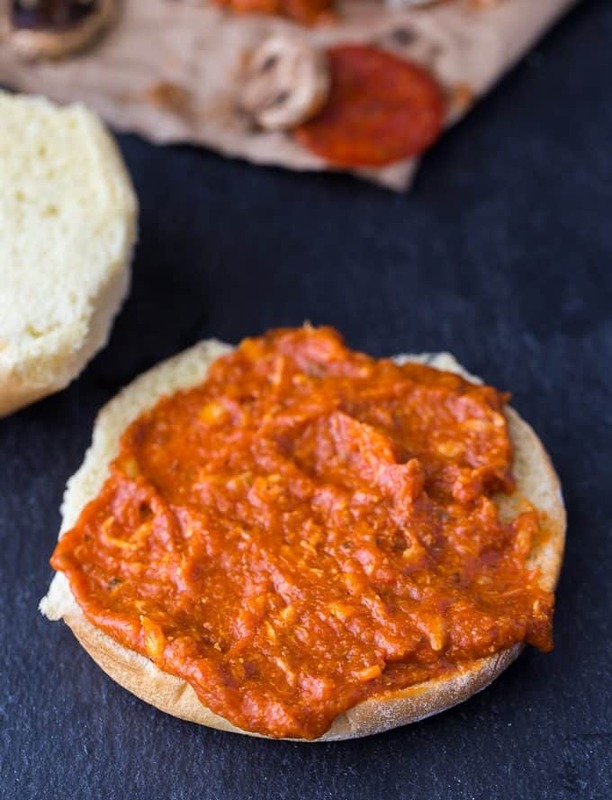 Spread Mozza Marinara Dip on the bottom of each of the six hamburger buns. Top each with a burger with the melted mozzarella cheese. Spread onions and top with green pepper and mushrooms. 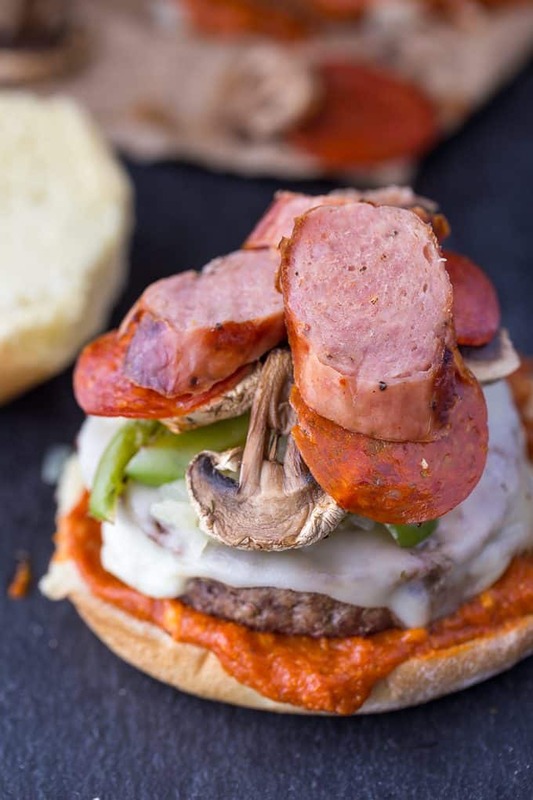 Add pepperoni slices, sausage slices and two strips of bacon to each burger. Finish off with the top half of the bun and serve. I want to come to your “Burger Bar”!!! I am so hungry now!!! It all looks delicious. This looks like a perfect meal for Friday night. I have all the ingredients so I know we’re having for dinner tonight. how great is this?! and why have i not tried bacon on the bbq??????? This is an awesome variation of a burger! We usually grill regular burgers, hot dogs, and corn. We will definitely have to try this out! Now that is one loaded burger! But I love the concept, thanks for sharing! It looks like you were having way too much fun with your new BBQ! The pizza burgers look delicious. I see a lot of summer parties in the future at your house. These look really good. This would be something my family would enjoy on movie night. I started drooling when I got to the sauce on the bottom. Oh help me – I need those burgers in my belly! 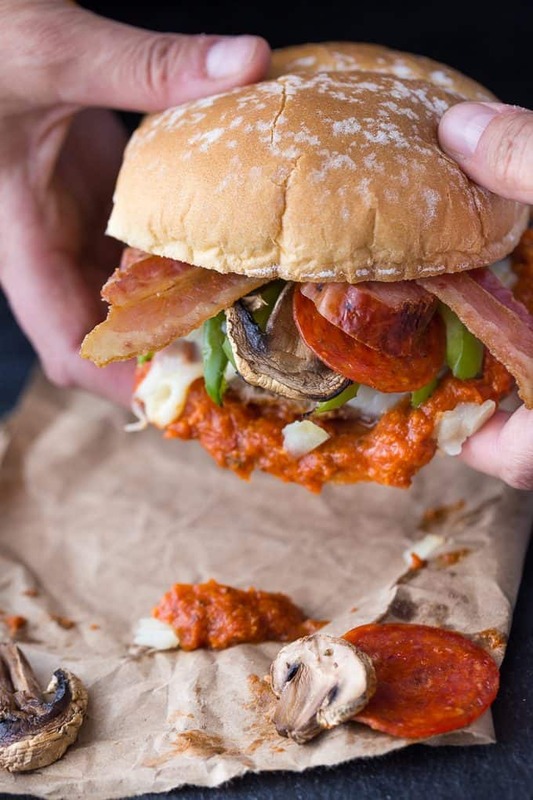 I love a good burger, but sadly have never tried the pizza burger, now I need too, they look so good you have me drooling!! OMG THIS IS SUPER GENIUS!!! I mean PIZZA? In a BURGER? Girl, you are out of this world! If it doesn’t get all over the place, it doesn’t belong in your face! That is an amazing looking burger. Those are certainly some deluxe pizza burgers, will have to try to make them. I am not sure I could eat a whole one though! HOLY MOLY! Now THAT is a burger if I have ever seen one. Stacie, these are fantastic. 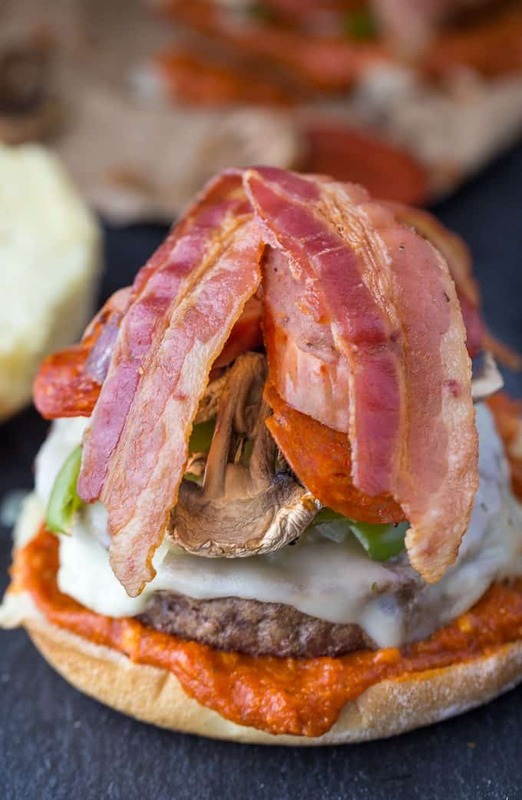 What a unique idea, I mean I have come across pizza burgers but nothing like this. You raised the bar with all that beautiful photography too. When my husband sees this he will freak out! That sounds like something that he would devour. It looks really good! I’d take mine with EVERYTHING! All the flavors would be so good. Wow, that is one loaded, crazy-yummy looking burger! boy do these look good, they would be a huge hit! Pizza burgers sound so awesome! I can’t believe I’ve never thought of this. Hamburgers were on the menu for tonight’s dinner. I think I’m going to do these instead. What a great blending of flavours. Thanks for the ideas. OMG these burgers look amazing. Thanks for the great idea for dinner. I am going to run out to the store and get the ingredients I need to make this tonight. These look absolutely scrumptious and quite filling. These would be perfect on those nights when I don’t want to heat up the kitchen. Thanks for sharing your recipe. Lots of delish toppings and layers of great foods. Oh this looks good… I’ll bet they would be fantastic with a skinless, boneless, chicken breast too! Thank you so much! I am thinking about them now!! My only question: How do I get my little mouth around this great burger? OMG That’s massive! LOL! This burger would be heavenly to my brother and father! Definitely a cool treat. I’ll stick to my fish and salad. What an amazing idea!! I’m definitely making these soon! It’s great because people can customize them to their liking so everyone’s happy. Who would have thought two American staples could come together to make such a yummy combo meal? Looks like a heavenly treat! Who thought a burger could be so versatile. Heavenly recipe. These look so delicious! We are always looking for a spin on a burger. This is perfect. WOW! Now that’s a mouth full of flavors! Looks tasty! Wow! You learn something new everyday! This would be awesome for a tailgate party! I pinned this! Sounds amazing! 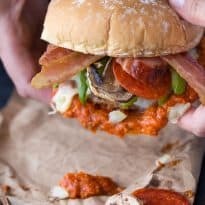 Deluxe Pizza Burgers! As delicious as the pictures! Now, that’s what we call Yummizza ! Could these pictures be any better? I think not! This burger looks amazing and the guys in my family would not get enough! Oh how I love burgers! That looks so delicious! I love Pizza and having it in a burger is amazing! I never thought about having this. I will have to make it. Thanks for an awesome recipe. Hi Stacie, you have inspired me to try this. It looks like a party in your mouth. My husband loves pizza, so he should love this. Thanks so much for sharing this tasty burger at DI&DI. Looks so yummyt! Thanks for sharing at the Inspiration Spotlight party. Shared. 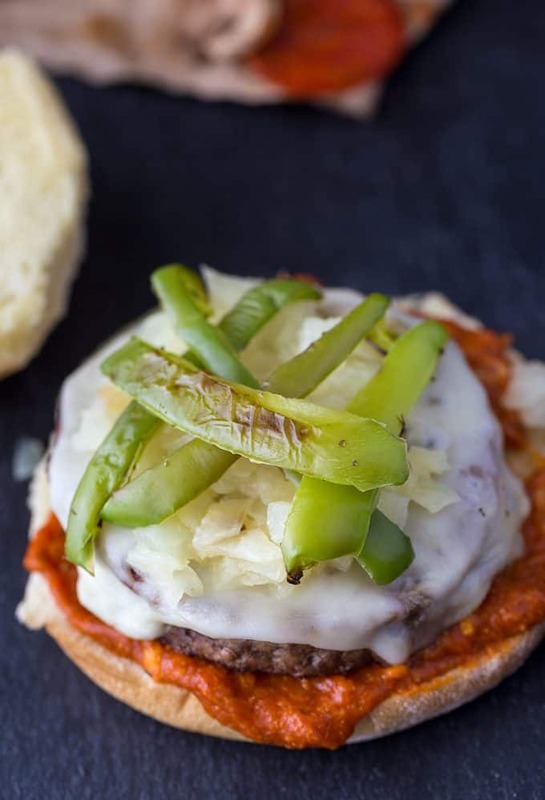 We love grilling in the summer, and we also love trying new burger recipes! My family would love this! Pinning to try later! Thanks for sharing at #SmallVictories linkup! Oh, yum! 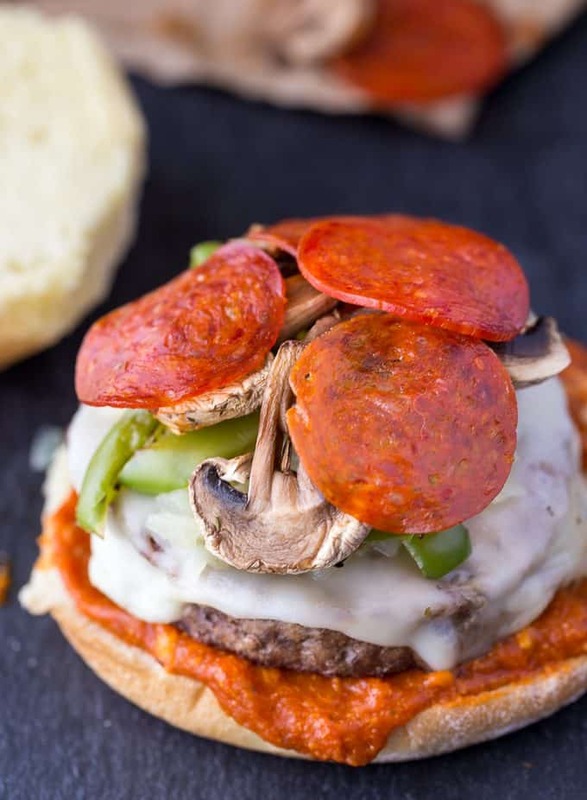 These Pizza burgers look so delicious and I really want to make them. I know my kids and I would love to try these out! Wow! This looks like the ultimate pizza! The addition of bacon is nice if not nontraditional.